Available from Amazon. Coming soon from other retailers. NOTE: Previously available in the Come Undone anthology. Zerek, a smuggler and rebel, has made a life’s work of trying to save his fellow humans from enslavement at the hands of the predatory Hilruda. But humans are losing the battle and once they’re no longer a threat, the Hilruda will turn their attentions to the third species on the planet, the Kadrussians. 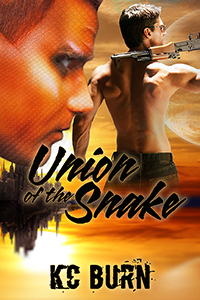 Essian, leader of the Snake clan, is the closest to a prince the Kadrussians have. There’s no way he’s going to let the Hilruda become the dominant species on the planet but none of the clans can stand independently against them. Overcoming generations of autonomy to unite the clans would be tricky enough, but doing it without the Hilruda realizing what’s going on will be impossible. But Essian’s found a secret weapon – Zerek. An unexpected attraction between the two complicates their mutually beneficial agreement. The idea of Essian choosing a simple human smuggler over a more appropriate Kadrussian mate is unthinkable, no matter how much Zerek might want otherwise. Cooperating with Essian might be Zerek’s last chance to save humanity but it could cost him his heart and his happiness. This entry was posted in New Releases, Self Publish by KC. Bookmark the permalink.